Melbourne Lifestyle Blog: Chin Chin. Apparently the hottest new dining spot. Chin Chin. Apparently the hottest new dining spot. Being overseas for a few weeks, I return to find the cool climate of Melbourne’s dining scene changed. Now everyone is talking about, you guessed it, Chin Chin. The food is a mixture of Asian cuisines: Thai, Malaysian, Vietnamese - not Japanese otherwise it would be named after a body part, making conversations about eating Chin Chin TMI. With modern gastronomy in a funky atmosphere, it is no wonder that Melbourne has adopted this venue with gusto. The decor is uber cool with monotone mosaics, vintage style posters and hanging naked light bulbs. The buzz is equal to that of a hip summer party with Melbournian’s packing the place for lunch and dinner. Turning up twice to find it too packed for dinner, I rescheduled my visit for an early weekday lunch. Yes, that’s right, there are no bookings here. The menu is a mixture of aromatic dishes. My excitement was exacerbated by the scent of coconut milk and lemon grass drifting from the kitchen. I’m so hungry, was all that I could think. There are vegetarian dishes in most of the menu sections. Don’t be fooled by the “green stuff”, this refers to salads rather than veggie-only-meals. 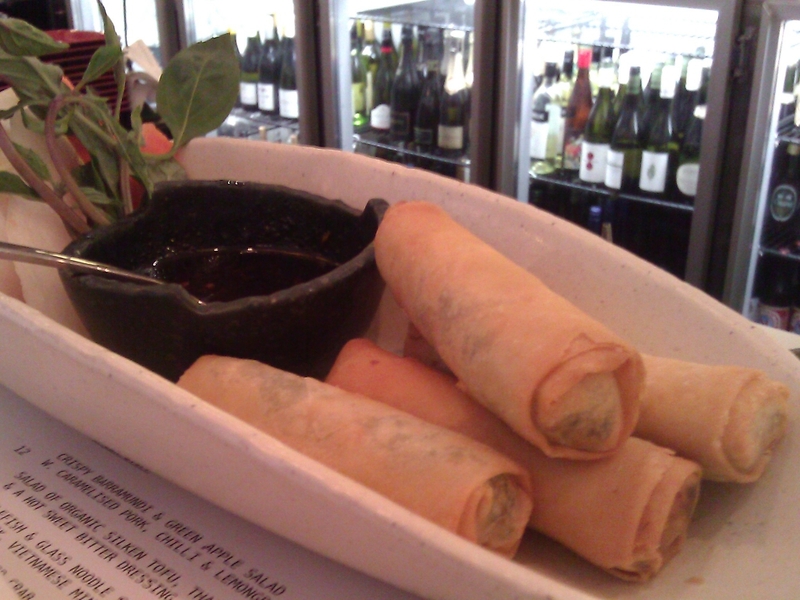 For entree we shared the spring rolls. These were crammed with silken tofu and shitake mushrooms. It was an interesting take on the Vietnamese staple. They would have been lacking in flavour if it were not for the delectable, tangy, soy and yellow bean sauce. Sharing is recommended, but, being the sole vegetarian, we ordered separately. The curries came with rice and the servings were huge. One curry could easily have been a meal for two. The Penang curry with eggplant and sweet potato was delicious. 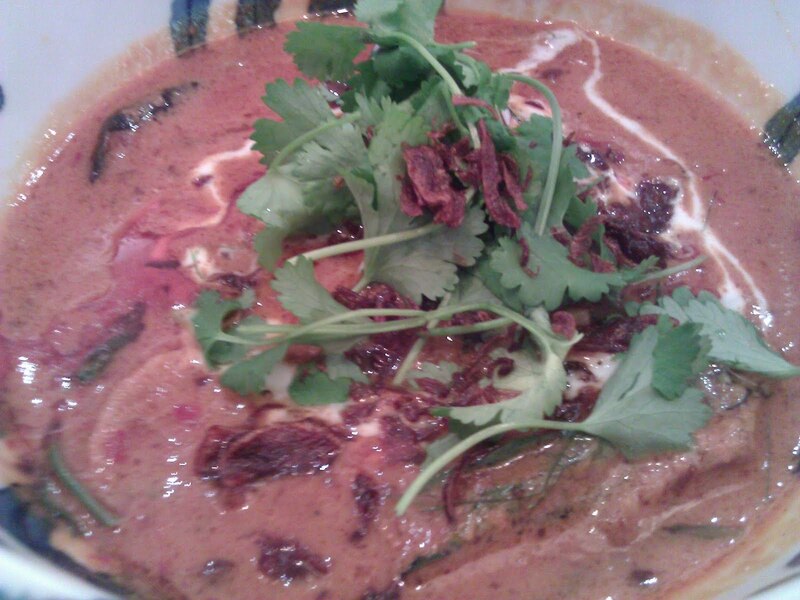 The sauce was creamy and flavoursome with lots of lemongrass and coriander. I loved the added crunch of the peanuts too. The eggplant was used sparingly, and the sweet potato was soft but together. We were seated at the bar, which was hard for conversation between three but would have been perfect for two. The waiter was almost too attentive – picking up on our personal conversation to serve us. It felt very intimate despite the masses surrounding us. He proactively asked us if we had a tight timeframe, the food came out quickly, our water glasses were always full and all came with a smile. Nothing to fault. We really enjoyed our meal. I would be here more often... if only I could be guaranteed a table.